I’m writing this at the end of August, but this section of the airplane was done last May. It seems I took most of the summer off from building. The good news is I did a lot of flying, including a trip to Oshkosh - a little more on that in the next post about the flaps. All the sections seem to start in the same way. Take some big pieces and make them smaller. The long angle piece in the first picture gets cut into pieces. 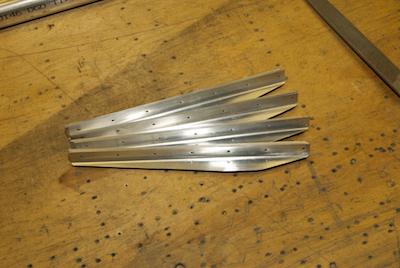 Those then get trimmed and finished to be come the skin stiffeners for the ailerons. The second picture is a close up of the long stamping uncut and another stamping that has been separated. 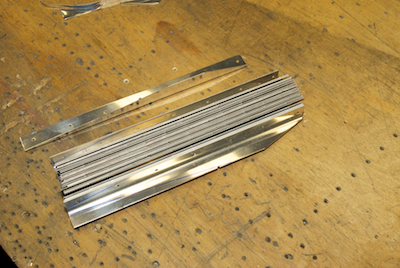 When I bought the Sonex kit, Sonex would have just supplied long section of angle. 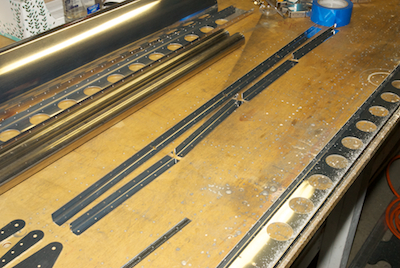 I would have to chop cut to the length of the piece, measure out and drill the pilot holes and then measure out and rip down the angles to make the finished pieces shown in the last picture. 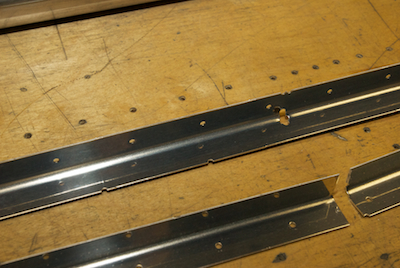 These stampings however save time on much of that. The non rivet holes in the piece indicate how to make all the cuts. It goes pretty quickly and you can’t make any measurement errors.